The best magic tricks are always simple, but powerful enough to leave an impact on your memory, as you wonder for days upon end how they were able to pull off such an impossible feat. Louis Leterrier’s 2013 action caper Now You See Me was far from simple, piling plot twists on top of other plot twists while also trying to work its way around a complex plot, and even though it could be entertaining it certainly wasn’t memorable enough to last in people’s memory banks the rest of that summer, or even warrant a sequel. This being Hollywood, however, somebody remembered it enough to continue the story, and now director Jon M. Chu – who you’ll recall as being the guy who couldn’t even adapt Jem and the Holograms correctly – has been brought on board to ensure that the show goes on, come what may. However, Chu forgets to bring with him that one vital ingredient to make this magic show actually work: magic. 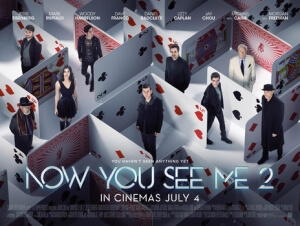 Another one of 2016’s by-the-numbers unnecessary sequels that exists simply because the first one made money, Now You See Me 2 picks up roughly a year after the events of the first one, where the remaining members of the Four Horsemen magician quartet, including illusionist Daniel Atlas (Jesse Eisenberg), hypnotist Merritt McKinney (Woody Harrelson) and sleight of hand maestro Jack Wilder (Dave Franco) – with an absent Isla Fisher replaced by Lizzy Caplan’s street magician Lula – as well as their ringleader, FBI agent Dylan Rhodes (Mark Ruffalo), are roped into an international caper when they are suddenly transported to Macau, China and into the hands of reclusive tech prodigy Walter Mabry (Daniel Radcliffe). The thing about the first film, as unmemorable as it turned out to be, is that it had a complete story; it had a beginning, middle and end, leaving everything either resolved or left to the audience’s imagination, like a good magic trick should. This sequel, however, continues a story that honestly shouldn’t have been continued at all, if it weren’t for the fact that it was a commercial success. Like so many sequels we’ve seen this year so far, from London Has Fallen to The Huntsman: Winter’s War among others, that is the only reason this follow-up exists at all, because it doesn’t do anything interesting or new with the characters, it doesn’t further the story beyond the point where we last left off, and it all feels more like a P.S. note rather than an actual separate story. It’s just more of the same, but not as engaging because there’s never a reason to care or be invested, even though nothing in the convoluted and twist-heavy script makes any kind of logical sense. Not helping is that Chu isn’t a great action director, over-choreographing everything from fight scenes to the central heist sequence, while also having the camera shake around so much and the editing going by so quickly that you can hardly make out what is actually happening, meaning all that choreography has all but gone to waste. When it comes to some of the actual magic tricks, Chu tends to cheat by heavily using CGI to achieve the impossible instead of actually having the performers do it right there on camera, even with the help of professionals; again, we are so used to this illusion now that we can see right through it and thus the trick is spoiled, so why Chu and many of the people working on this film thought they could get away with this when trying to perform actual magic is extremely lazy and unimaginative. Even Leterrier gave the first film some kind of practical presence with easy-to-watch action, and he went on to do Grimsby, for Christ’s sake. Hardly any of the leftover cast from the first film feels like they actually want to be there, caught in some kind of binding contract and forced to return to characters even they probably forgot about by this point. Attempts to give some of them more to do also fall flat, like the dumb and pointless addition of Harrelson’s evil twin brother (also, of course, Harrelson), and make it more obvious that new additions like Caplan and Radcliffe are having way more fun than they are with what little they have to work with. They obviously don’t care, the audience doesn’t care anymore, so is it any wonder why – again, like so many other sequels this year – this one isn’t resonating as well with audiences as before? It may promise one hell of a magic trick, but Now You See Me 2 just ends up being a bit of a con. Now You See Me 2 is a highly unnecessary sequel that never justifies its existence, with Jon M. Chu poorly executing convoluted action scenes and CG-heavy magic tricks that never manage to amaze.